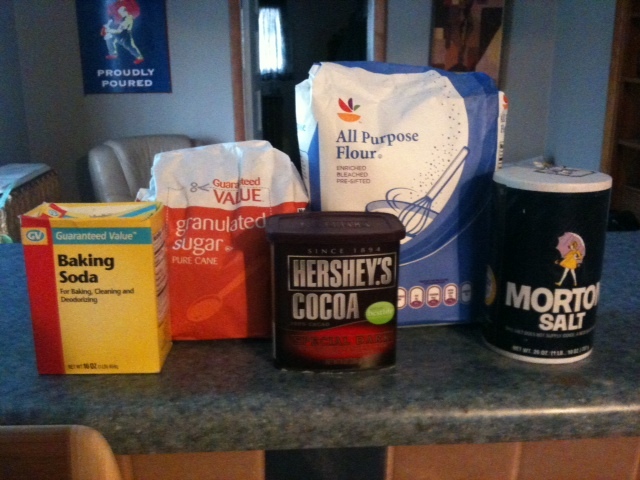 We’re throwing a party at my house tonight, which means that it’s time for me to bake. If you follow me on Twitter (or we’re Facebook friends), you know that I bake a fair amount. Now that we’ve created The Beer Circle, however, I’m trying to focus more on incorporating delicious brews into my baking (and cooking). 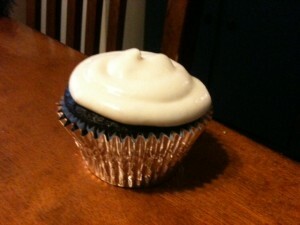 Tonight’s treat is Dark Chocolate Founder’s Breakfast Stout cupcakes, topped with a bourbon frosting. It seems that most stout based baking recipes use either Guinness or Young’s Double Chocolate, and reviewers complain about not being able to taste the beer. As a result, I wanted to use something more complex that would shine through the rest of the ingredients. Further, coffee flavoring helps highlight the flavors of chocolate– most recipes for chocolate cake actually include a strongly brewed cup of coffee! For the cupcakes, I adapted this recipe from Dave Lieberman over at the Food Network, changing out the cocoa powder and beer used. The frosting is a result of my roommate, who is a bourbon fanatic. As I was thinking about it though, I realized that the bourbon frosting may actually make the cupcakes taste like Kentucky Breakfast Stout cupcakes– Never a bad thing! The frosting recipe is adapted from Katie’s recipe for Maple-Bourbon Frosting at Haute Apple Pie. I took out the maple, but if you left it in you could have cupcakes that channeled Breakfast Stout, Kentucky Breakfast Stout, AND Canadian Breakfast Stout. Crazy. 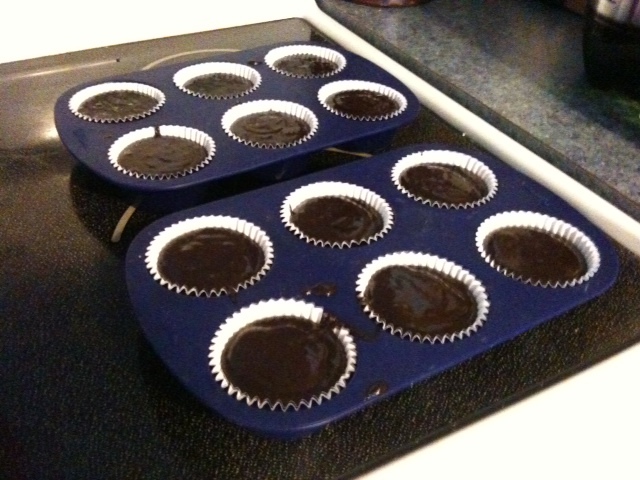 Preheat your oven to 350, and either lightly grease 24 cupcakes worth of tins, or put in liners. In a separate (large) bowl, mix together the stout and the vanilla. 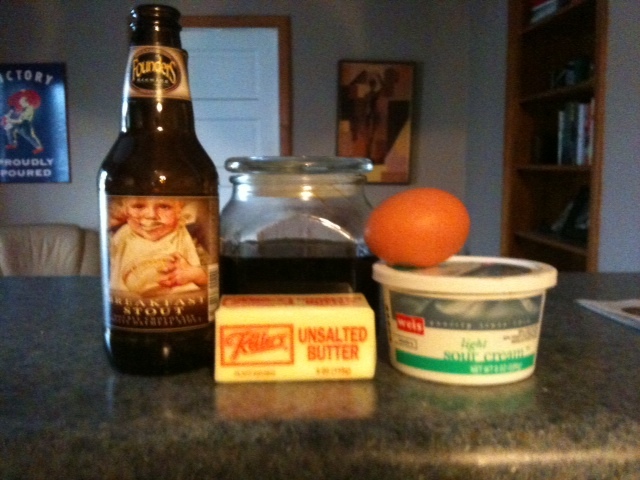 The melted butter will also need to be added to this mixture– this is why it’s very important that the stout is not cold, or it will cause the butter to curdle (which is what I did the first time. and I had to pour it all out. Learn from my mistakes!). On my second attempt, I actually tempered some of the stout/vanilla mixture into the melted butter before combining it all. Beat the eggs in individually. My mixture here still looked a little weird, but it seemed to be mostly from beer foam (and the cupcakes turned out well). Mix in sour cream until thoroughly combined. (The original recipe said until smooth; mine was not smooth). Gradually mix in the dry ingredients; I did it about a cup at a time. Divide the batter between the 24 muffin cups. Bake for 12 minutes, rotate, and then bake for another 12-13 minutes, or until the center of the cupcakes are set, but soft. Wait until cupcakes are completely cool to frost. 1 8oz pkg cream cheese (They recommend reduced fat, I veto that). “Good” bourbon, such as Maker’s Mark (I’ll admit, I used Evan. I didn’t realize we were out of Maker’s). Beat butter and cream cheese until creamy. Beat in one cup of powdered sugar. Add bourbon; beat well. Beat in remaining powdered sugar 1 C at a time, making sure that you like the level of bourbon flavor in the frosting, as well as the consistency. My balance came sacrificing the consistency a bit for the flavor in that it wasn’t quite as viscous as I wanted. I think I ended up with 6T of bourbon (the original recipe called for 2) and 4-5C of powdered sugar. This made the frosting quite bourbon heavy when tasting alone, but I really wanted it to stand up to and compliment the rich, dark flavor of the cupcake. Note: This makes WAY more frosting than you will need for 24 cupcakes. For frosting, I like to put the frosting in a ziploc bag, cut one corner off, and “pipe” it on that way. One day I’ll be a grown up with a frosting bag. Final Cupcakes: Reading for Eating! Voila! These cupcakes were a huge hit. I frosted a few of them just with basic chocolate for my non bourbon loving friends, but honestly the bourbon frosting blew the chocolate frosting out of the water in terms of overall flavor. Last updated by Paige Deckert at February 29, 2012 .